Royal navy and the German Kriegsmarine on may 24th 1941. This is the final battle of the pride of the royal navy, the Battle-cruiser HMS Hood, that was sunk by the German battleship Bismarck. The Battleship Bismarck and the heavy cruiser Prinz Eugen were attempting to brake out into Atlantic waters to attack and stifle allied shipping lines in what was to be called "Operation Rheinubung". however, they were to be cut of by the Royal navy instead. Originally spotted by neutral Swedish forces in the cruiser Gotland. The British embassy intercepted the information allowing the royal navy to send an intercepting force. Among them were the heavy cruiser HMS Norfolk and Suffolk. Throughout the evening of may 23rd the two ships commanded by Rear-admiral Frederic Wake-walker tracked the Bismarck and Prinz Eugine utilizing the Suffolk's newly installed radar system taking away the Germans weather advantage. 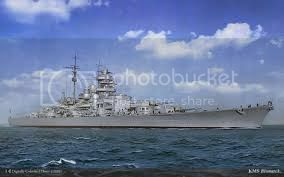 In the morning to follow eight British ships were sent to put an end to the battleship Bismarck. This fleet consisted of six destroyers, the battleship HMS Prince of wales and the Battle-cruiser HMS Hood commanded by Vice-Admiral Lancelot Holland from within the Hood. The fleet was to intercepted the Bismark and the Prinz Eugen in the strait between Iceland and Greenland with the Norfolk and Suffolk to engage the Prinz Eugen while the Hood and Prince of Wales were to engage the Bismarck. Fredrick Wake-Walker would use the remainder of the sunset to cloak their aproach in the Norfolk and Suffolk while the Hood and Prince of Wales would approach under the cover of darkness placing the brittish ships in close quarters, giving the British an advantage from the plunging fire of the Bismarck. However this plan was reliant on the Norfolk and Suffolk maintaining continuous contact with the German ships. Unfortunately this was not the case for the Suffolk lost contact with the German ships for 90 minutes. Holland did not spot the enemy ships at the location he had planned and due to maintained radio silence did not receive any new information from Frederic Wake-Walker. This led to Holland deciding to split the destroyers on a northern path to search while he ordered the Hood and the Prince of Wales to proceed in a south, south-west direction to search for the enemy. One hour after Holland had planed his attack the Suffolk regained contact with with the German forces placing the Hood and Prince of Wales 35 nMi away just ahead of the Germans. Holland ordered a speed increase and to turn towards the enemy. However instead of the swift head on approach he wanted he now had the disadvantage of a wider angle and much slower approach. This placed the hood and Prince of wales in harms way for a longer time period in the Bismarck's optimal firing range. Furthermore, to make matters worse the Suffolk reported further course change by the German boats heading west placing the ships nearly abeam to each other. 2 hours 35 minutes later the Prince of Wales lookout had spotted the German boats. 10 minutes later the Germans using their hydroponic equipment also spotted the British. Holland, at this point, could have chosen to order the Hood and Prince of wales to fall back with the Norfolk and Suffolk to shadow the Germans while they waited for Tovey to arrive with the King George the V and other boats to arrive. He did not and this decision was a mistake that would cost the lives of 1,428 soldiers including Holland himself. The Hood fired first shooting at the leading ship thought to be the Bismarck, however incorrect, followed by a salvo from the Prince of Wales. Both ships missing their marks. 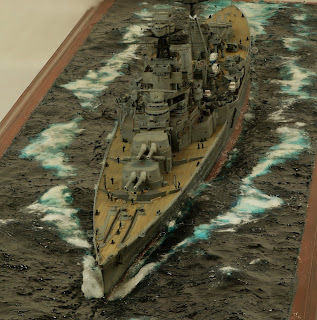 It is believed that Prince of Wales commander identified the rear ship as the Bismark whereas the hood continued to target the Prinz Eugan for some time. Both ships continued to fire salvo after salvo at the German ships, neither hitting their mark. Shot after shot flew past the German decks hitting the sea around them spouting up pillars of water. However, the German ships continued to hold their fire patiently. It is said that Kapitan zur See Ernst Lindemann of the Bismarck responded with, after repeated inquiry from the gunnery officer for permission to fire, "Ich lasse mir doch nicht mein Schiff unter dem [edited] wegschießen. Feuererlaubnis!" (I'm not letting my ship get shot out from under my [edited]. Open fire!) Finally the Bismarck, followed by the Prinz Eugen, targeted the Hood firing a salvo. The first salvo from both Bismark and Prinz Eugen barely miss Hood. Both British ships were now firing on the rear ship now, as Holland has realized he was firing on the wrong ship. Four minutes into the battle a one tone shell from the 15" main cannon on the Bismark found its target. Landing on the hoods deck it started a fire in the ready-use 4in (100mm) ammo storage locker. This, however, was not the shot that took her down. Soon after another shell hits the hood close to the main tower again injuring but not sinking her. At just 8 miles out Holland orders the two ships to port intending to use all of their main guns but the Bismark is already zeroed in on Hood. Finally the Bismark fires a fifth salvo and a 1700lb shell flies through the air towards Hood. It was a direct hit penetrating deep under the deck igniting the powder in a main magazine. Witnesses say a pillar of flames shot up from within the ship followed by a massive explosion that tore her in half. The stern sank right away but the bow began to lift vertically into the air sinking rapidly. As Hood slipped forever into the waters of the Denmark strait one last defiant salvo is fired from the now vertical ship. It is believed to have be fired from the doomed gun crew. only three were to survive out of a crew of 1,418 crew whom were to be rescued several hours later by the destroyer HMS Electra. Now the Prince of wales is alone nothing more than a burning oil slick remains of the hood. Both German ships turned their sights to the Prince of Wales. The command from the Germans is simple, fire everything! With that the Bismarck and Prinz Eugen open fire. Salvo after salvo were fired hitting the Prince of Wales 7 times critically damaging it. With all of its guns jammed and no way to fight back the Prince of Wales sounded a retreat and escaped with their lives. The Bismark did not escape unscathed for it had taken three hits from the Prince of Wales during the course of the battle. The Bismarck was now listing, taking on water and leaking oil. The crew abandoned their mission and tried to retreat back to occupied france for dry dock and repairs, however they would never make it back in one piece. Three days later the allied forces tracked down the Bismarck and she was sent to the bottom of the ocian in waht would later be known as the sinking of the Bismark. Not bad at all,good job :) +1. I happen to be a fast reader,thank you :P,You better make more. Good job Lennon 82. +1 try adding a picture or two to bring up your post and ad visual appeal. Great job fun to read thanks, its always hard to believe how quickly the hood went down and how few survived. note to self deck armour! Great choice of photos! they really help make your thread all the better. A shame it is a good post. The documentary that Robert Ballard did on discovering the Bismarck wreck was also well done. It's interesting that his analysis of the wreck supported the claim that Bismark was scuttled. No this is the first I've heard of it. Was it any good? I have his book on Iron Bottom Sound and thought it was some of his better work. I was really hoping that when he found Kirishima she would be in good shape but unfourtunately she never righted herself and now lays keel up . Oh wow, so some looking person got a job with Robert Ballard by playing a sim. Not to shabby! I would have definitely given it a shot just for the opportunity.